NATIONAL HARBOR, MD – A national survey of school meal program directors finds school districts are utilizing more tactics - holding student taste tests, locally sourcing produce and scheduling recess before lunch - to increase student consumption of healthy school meals and combat food waste. The findings are part of School Nutrition Association (SNA)’s “School Nutrition Operations Report: The State of School Nutrition 2018,” based on survey responses from 1,550 school districts nationwide. “School nutrition professionals are determined to find new ways to ensure students enjoy the healthy options available with school meals and benefit from all the nutrients they provide,” said SNA President Gay Anderson, SNS. Grab and Go kiosksoutside of the cafeteria have gained in popularity in middle and high schools, with this service option available in 61.8% of districts, up from 56.2% two years ago. Other notable trends tracked in the report include district demographics, school meal prices, lunch periods, afterschool and summer meals, procurement practices, equipmentand technology.The State of School Nutrition 2018 survey was conducted in May and June 2018. The report is based on the analysis of 1,550 responses received from SNA members representing districts nationwide. It's that time again, folks: We're due for another round of Dietary Guidelines. The Trump administration, already months behind in the process, posted Wednesday a call for nominations for the 2020 Dietary Guidelines Advisory Committee. The panel, known as DGAC, will be made up of outside experts who provide "independent, science-based advice and recommendations" to USDA and HHS to help the agencies develop the Dietary Guidelines, which are updated every five years. The fight over the 2015 installment: The makeup of DGAC will be of intense interest to food and agriculture groups. MA readers will recall that the 2015 Dietary Guidelines were extremely contentious, with nasty public feuds over recommendations for meat and sustainability issues (refresh your memory here). Brandon Lipps, USDA's acting deputy undersecretary for food, nutrition, and consumer services, said Wednesday he's hoping for a "robust group of nominees" to serve on the panel, and encouraged public involvement. "The public's participation throughout the development of the guidelines is crucial as we work hard to ensure the process is transparent and science-driven," he said. New territory: The next Dietary Guidelines will cover 2020-25. For the first time, the panel is mandated by law to include dietary advice for women who are pregnant and infants and toddlers from birth to 24 months. Time is short: USDA says nominations for the committee will be accepted over the next 30 days. As part of a $12 billion farm aid package, the USDA Agricultural Marketing Service (AMS) will administer a Food Purchase and Distribution Program to purchase up to $1.2 billion in commodities for nutrition assistance programs, including school lunch and breakfast. SNA provided recommendations to reduce burden, improve efficiency, and increase accuracy for the proposed collection of contact information for schools participating in the NSLP and CACFP. The data collection is to gather contact and other information on a voluntary basis from schools and organizations that participate in the NSLP and CACFP to enter these schools and organizations into the Team Nutrition database. ALL EYES TO CONFERENCE AFTER SENATE FARM BILL PASSES: The Senate's easy passage of the farm bill Thursday gives Ag Chairman Pat Roberts (R-Kan.) and ranking member Debbie Stabenow (D-Mich.) momentum heading into conference negotiations. The pair, a united front throughout the process, acknowledged as much following the 86-11 vote. "I think the strong vote is very helpful to us and it is not true that I was using tasers on who was going to vote 'no,'" Roberts joked, standing alongside Stabenow as they spoke with reporters outside the Senate floor. Power couple: Throughout the week, the duo wrangled competing requests from senators angling to get their individual proposals attached to the sweeping farm and nutrition policy legislation. Most significantly, they joined forces to defeat an amendment that would have put in place stricter work requirements on some food stamp recipients than those in the House version. The proposal from Sens. John Kennedy (R-La.) and Ted Cruz (R-Texas) would have expanded work requirements for able-bodied adults without dependents, as well would have required recipients to show photo I.D. when purchasing groceries using benefits. SNAP showdown: Although that amendment went down, reconciling different approaches to the Supplemental Nutrition Assistance Program promises to be the biggest challenge facing the conference committee. The House bill would strengthen work requirements on between 5 million and 7 million SNAP recipients — a slice of Speaker Paul Ryan's welfare reform agenda that led to unanimous Democratic opposition when the bill passed last week. Roberts and Stabenow were careful to avoid that hot-button issue, with both leaders saying repeatedly that the House's SNAP proposals would never clear the 60-vote threshold in the upper chamber. But Roberts suggested that the Senate bill's administrative changes combating fraud in food stamps, among other tweaks to how the program is carried out, have been overshadowed by the SNAP changes in the House bill. He admitted that he should have communicated his ideas more clearly to fellow Republicans. "If you look at what we did, without the backdrop of what the House did, it is terribly significant and is right on the money of getting integrity into the program," he said. "I needed to really talk about that more to my Republican colleagues and, who knows, we could have hit 90 [votes]." All of the 11 "no" votes came from Republicans: Richard Burr, Bob Corker, Tom Cotton, Jeff Flake, Dean Heller, Jim Inhofe, James Lankford, Ron Johnson, Mike Lee, Rand Paul and Pat Toomey. The path is expected to be much smoother than it was on the House side, where the GOP conference was divided and Democrats refused to support the bill over new work requirements for food stamp recipients. But Roberts also isn't taking any chances, and that means he may try to roll several lingering amendments into a manager's package instead of allowing a large number of issues to erupt on the floor. On Thursday the White House released its plan for reorganizing the federal government, an effort that was announced earlier in June. While the initial announcement suggested that all functions of the USDA’s Food and Nutrition Service (FNS) would be moved to the Department of Health and Human Services (HHS), the plan calls for USDA to “continue to administer the commodity-based programs, including the National School Lunch and School Breakfast Programs.” HHS would assume control of other programs, including the Supplemental Nutrition Assistance Program (SNAP). The Food and Nutrition Service announced that it is awarding $5.2 million in grants as part of the USDA Farm to School Program. The U.S. House 2018 Farm Bill passed the House on Thursday, June 21 by a vote of 213-211. The bill would eliminate Broad-Based Categorical Eligibility which would remove school meal direct certification for an estimated 265,000 students. The bill also contains language directing USDA to revamp the nutrition standards for school lunches, breakfast and all foods sold in schools. SNA has concerns about both provisions and is closely monitoring developments. In a Federal Register notice published on June 13, 2018, the U.S. Department of Agriculture’s (USDA) Food and Nutrition Service (FNS) requested public comment on a revision to a currently approved information collection for the Child Nutrition Program Operations Study-II (CN-OPS II). The purpose of the revision is to update the survey instruments for school year (SY) 2018-19 to include topics of current interest and collect timely data to inform Child Nutrition Programs (CNP) operations. Comments must be received on or before August 13, 2018. Near the bottom of the list are several topics related to the Child Nutrition Programs. The U.S. Department of Agriculture (USDA) published in the Federal Register its semiannual regulatory agenda, providing summary descriptions of the regulatory and deregulatory actions being developed in agencies of the U.S. Department of Agriculture (USDA) in conformance with a number of Executive orders. The full agency rule list is available at Reginfo.gov, and includes the Interim Rule for child nutrition program flexibilities for milk, whole grains, and sodium requirements released in 2017. SNA has been fighting hard for the legislative and policy priorities that ensure adequate funding and reasonable regulations so you can do what you do best – keep kids nourished and ready to learn! Half-way through the year, 2018 school nutrition advocacy shows no signs of slowing. Here’s a quick recap of the exciting progress we’ve made, including new funding, education efforts, and program simplification. Shortly after the release of the 2018 Position Paper, SNA held its 46th annual Legislative Action Conference, when nearly 900 school nutrition advocates converged in Washington, D.C. But even before they headed to Capitol Hill, attendees got an unexpected boost of support when Deputy Secretary of Agriculture Stephen Censky spoke at the Closing General Session. SNA recently announced the launch of the Stop the Block Coalition and website, a national network of allied organizations united in working to oppose any school meal block grant proposal. SNA members have been busy sending messages to their legislators, sharing the #StoptheBlock FAQs and infographic, and continuing local education efforts on the detrimental nature of block granting school nutrition programs. At a time when funding is hard to come by, the inclusion of our critical school nutrition programs is recognition by Congress of the important role our programs play in the lives of hungry children. On Friday, March 23, 2018,R. 1625 (115), Congress’ massive FY 2018 spending bill, was signed into law. It includes $2 million for training school food service personnel. The bill also provides $30 million in Equipment Grants. Congress is currently debating FY 2019 funding, and SNA is excited to report that the House and Senate bills contain several school nutrition prioritiesincluding $20 million for school breakfast commodities. This marks the first critical step in a multi-step legislative process. Since the U.S. Department of Agriculture's (USDA) Regulatory Reform Federal Register notice was posted on June 17, 2017, SNA has been collecting comments from members about how best to simplify school nutrition program regulations. Every submission was reviewed and suggestions were provided to USDA through letters submitted in September and November. The final letter is due in July and your suggestions can still be submitted in this SNA form! SNA has provided comments to USDA in response to several proposed rules, studies and notices, including; the Flexibilities for Milk, Whole Grains and SodiumProposed Rule, Hiring Flexibilities Proposed Rule, and Dietary Guidelines for Americans Topics suggestions. SNA provides regular updates on trending unpaid meal legislation in state legislatures through Quarterly State Legislation Reports and Tuesday Morning, and provides unpaid meal charge talking points to assist members in responding to questions. SNA is also offering a “Managing Unpaid Meal Charges” education session at the 2018 Annual National Conference. A panel of school nutrition directors and USDA will discuss different policies and best practices from districts across the country to help you assess what approaches may work best for your school community. Stay tuned for the release of a case study showcasing successful strategies to advocate for sensible unpaid meal policy. There is a plan PROPOSED by the Heritage Foundation to the White House that the school meals programs and SNAP be moved to Health and Human Service(HHS) away from USDA. That would move us away from Agriculture which is a strong supporter of our programs because of our link to the Commodities Program based at USDA. Last Wednesday White House officials revealed that the administration will release a plan to reorganize the federal government that includes moving the functions of USDA’s Food and Nutrition Service (FNS) to the Department of Health and Human Services (HHS). The Senate Agriculture Committee released the 2018 Senate Farm Bill and announced that a markup has been scheduled for Wednesday, June 13th. Chairman Roberts and Ranking Member Debbie Stabenow (D-MI) released a joint statement touting their efforts to craft a bill that could garner bipartisan support. This stands in stark contrast to developments in the U.S. House, where a partisan Farm Bill featuring drastic changes to the Supplemental Nutrition Assistance Program (SNAP) failed amid opposition from conservative Republicans. SNA will continue closely monitoring developments on the Farm Bill in Congress. In a memo published on June 1, 2018, the U.S. Department of Agriculture’s (USDA) Food and Nutrition Service (FNS) summarized the flexibilities provided to Child Nutrition Program (CNP) operators in School Year (SY) 2018-2019 for milk, whole grains, and sodium requirements. State Agencies may use their discretion to grant whole grain waivers for School Food Authorities that can demonstrate hardship. Sodium Target 1 will continue as the regulatory limit for breakfast and lunch programs. Operators in the National School Lunch Program (NSLP) and the School Breakfast Program (SBP) will have the option to offer flavored, low-fat (1 percent fat) milk as part of a reimbursable meal or competitive food sale. These flexibilities will be effective July 1, 2018 and are consistent with the Interim Final Rule published on November 30th, 2017. SNA submitted comments in response to the Interim Final Rule, thanking USDA for the temporary flexibilities and requesting permanent relief. So far both the House and the Senate Appropriations Committees have passed bills that include SNA's requests. See below. The U.S. Senate Appropriations Committee approved the FY2019 Agriculture Appropriations bill on Thursday, May 24th with a unanimous roll call vote. As with the recently passed U.S. House Appropriations bill, SNA was also successful in getting a number of its legislative priorities included in this Senate version. While both the House and Senate bills still have a number of steps to go, SNA is excited to see potential additional funding and program simplification gain ground. The Senate bill includes $20 million for School Breakfast Program commodities. It also requires that no funds may be used to implement Target 2 sodium levels, and appropriates $30,000,000 for competitive grants to State agencies for subgrants to local educational agencies and schools to purchase equipment. The committee report that accompanied the bill contained two provisions supported by SNA. The first encourages the Secretary of Agriculture to return to a 5-year Administrative Review inspection cycle for schools found to be consistently complying with Federal regulations. The second encourages USDA’s Food and Nutrition Service to simplify the whole grain waiver process to make it faster and more user-friendly for SFAs. When one in every six children suffer from hunger in the United States, millions of American school children could lose access to meals served through the National School Lunch Program (NSLP) and School Breakfast Program (SBP) if some Members of Congress get their way. The full House Appropriations Committee approved the FY2019 Agriculture Appropriations Bill on Wednesday, May 16th on a vote of 31-20. SNA was successful in getting two of its legislative priorities included in the bill language that the Committee approved. This marks the first critical step in the multi-step legislative process. SNA is excited to report that the appropriations bill includes $20 million for School Breakfast Program commodities. Further, SNA was also able to secure December 31, 2018 as the deadline to make a determination under Paid Lunch Equity provisions for the 2019-2020 school year. This will provide schools with a good grasp of meal prices well in advance of the next school year and will help in determining any potential future lunch price increases. At the hearing on Wednesday, the Committee also approved two amendments that impact school nutrition programs. The first eliminates restrictions on the inclusion of starchy vegetables in School Breakfast Program meals. The second directs the U.S. Department of Agriculture Secretary to issue recommended standards schools may adopt for unpaid meal policy. The U.S. Senate has yet to release a FY2019 Agriculture Appropriations bill. Both chambers must agree on a single version before it is sent to the President to be signed into law. 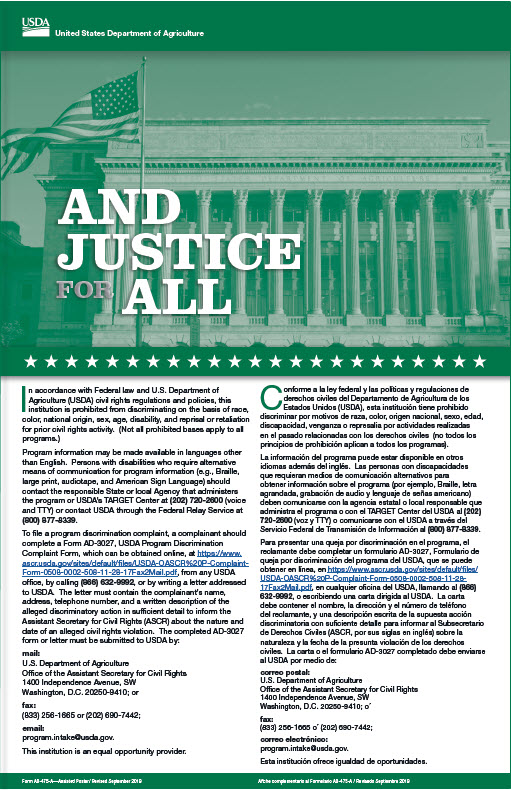 In a Federal Register Notice published on May 8, 2018, the U.S. Department of Agriculture’s (USDA) Food and Nutrition Service (FNS) announced the Department’s annual adjustments to the Income Eligibility Guidelines to be used in determining eligibility for free and reduced price meals and free milk for the period from July 1, 2018 through June 30, 2019. The adjustments are required by section 9 of the Richard B. Russell National School Lunch Act to account for changes in the Consumer Price Index. The RSC proposes to consolidate funding for child nutrition programs into a single block grant. This would include funding for the National School Lunch Program, School Breakfast Program, Child and Adult Care Food Program, Summer Food Service Program, and Special Milk Program. The block grant would give states control over where best they believe these funds overall should be allocated. This model is designed to encourage states to administer the consolidated grant funds efficiently and reduce any redundancies and deviations from promoting child nutrition among truly needy families. However, the School Lunch and Breakfast Programs also provide subsidies for “Full Price” meals served to those from families above 185 of the FPL. According to CBO, “in the 2016–2017 school year, federal subsidies are generally 59 cents for each lunch, 29 cents for each breakfast, and 7 cents for each snack”.196 Many conservatives may believe these subsidies, which average about $1 billion annually over the next decade, for those with the means to otherwise pay their own way are out of line with what the goals of the program should be. Further, the “school lunch and breakfast programs are subject to widespread fraud and abuse.”197 According to the GAO, the estimated improper payment rates for the Lunch and Breakfast Programs in FY 2013 totaled 15.7 and 25.3 percent, respectively.198 States in conjunction with the Department of Agriculture must take steps to address this problem. The United States Department of Agriculture’s (USDA) Food and Nutrition Service (FNS) has issued a Final Rule on Revisions and Clarifications in Requirements for the Processing of Donated Foods. It is effective July 2, 2018. The rule requires multi-State processors to enter into National Processing Agreements to process donated foods into end products, permits processors to substitute commercially purchased beef and pork of U.S. origin and of equal or better quality for donated beef and pork, and streamlines and modernizes oversight of inventories of donated foods at processors. The rule also revises regulatory provisions in plain language, to make them easier to read and understand. The Republican Study Committee, a group of conservative House Republicans, released its own fiscal 2019 budget plan, including a farm bill proposal containing a lengthy section on entitlement programs. The proposal seeks to promote cost-savings by splitting the nutrition and farm policy titles into separate legislation. House Agriculture Chairman Mike Conaway has indicated he wants to debate the farm bill on the floor as soon as possible in May. As part of FY 2018 spending bill, Congress provided that only school food authorities (SFAs) with a negative balance in their school food service account as of January 31, 2018 will be required to raise prices for paid lunches under the Paid Lunch Equity (PLE) provisions in the Richard B. Russell National School Lunch Act. The U.S. House Agriculture Committee held a mark-up of the 2018 Farm Bill on Wednesday, April 18. Among other provisions, Title 4 of the bill legislates nutrition programs such as SNAP and National School Lunch Commodities. The five-hour discussion on Wednesday centered around changes to SNAP, including new work requirements and elimination of Broad-Based Categorical Eligibility, which may impact school nutrition program direct certification in some states. According to a Center on Budget Policy and Priorities report, the Congressional Budget Office has indicated that 265,000 students will be impacted by the elimination of Categorical Eligibility and resulting loss of access to SNAP. No longer directly certified through SNAP, parents of these students will be required to complete an application and reestablish access to free school meals. The bill passed Committee by a vote of 26-20. Committee Chairman, Rep. Mike Conaway, stated that he plans to bring the bill to the House floor in May for a full vote. The farm bill covers five years of funding and policy changes and is due for reauthorization in 2019. SNA continues to monitor progress on the bill and urge House and Senate Agriculture Committee members to push for an expansion of USDA Foods to support the School Breakfast Program as part of the bill. Secretary Sonny Perdue provided testimony during the April 18th U.S. House Committee on Appropriations FY2019 USDA Budget hearing. In his opening statements, Chairman Robert Aderholt thanked the USDA for providing schools with “long-overdue flexibility” and encouraged issuance of the Final Rule. Senator Dan Sullivan (R-AK) introduced S. 2641, The American Food for American Schools Act of 2018, on April 10, 2018. House Agriculture Committee Chairman Mike Conaway (R-TX) released his draft Farm Bill proposal last week signaling the beginning of efforts to renew farm and food policy legislation. The farm bill, which is due for reauthorization in 2019, covers five years of funding and policy changes in matters involving USDA. SNA continues to monitor progress on the bill and to urge House and Senate Agriculture Committee members to push for an expansion of USDA Foods to support the School Breakfast Program as part of the bill. Learn More. Our friends on the Budget and Appropriations team are combing through all 2,232 pages of the massive spending bill signed into law last week. USDA and FDA programs will receive about $23.3 billion in discretionary spending through September under H.R. 1625 (115),about $2.4 billion more than fiscal 2017 enacted levels despite the Trump administration's calls for cuts. - Child nutrition programs, a mandatory funding program that supports free and reduced-price meals to low-income school children, gets $24.25 million, matching the Trump request and about $2 million more than current levels. This helps pay for about 30.6 million school lunches and 15.7 million school breakfasts every day, according to the USDA. - Commodity assistance programs, which help fund soup kitchens, food banks, farmer's market, nutrition programs and other emergency assistance programs, are slated for $322.1 million over two years. That's above the $294 million in Trump's request and current levels of $313 million. On Friday, March 23, 2018, President Trump signed H.R. 1625 (115), otherwise known as Congress’ massive fiscal year 2018 spending bill. The over 2,000-page, $1.3 trillion dollar bill was introduced in the House on Wednesday night and passed on Thursday in a 256-167 vote, then went to the Senate where it was passed on Friday morning on a 65-32 vote. The bill needed to be signed into law before midnight on Friday to avoid a government shutdown. The massive funding bill included $2 million for training school food service personnel. The funds may be accessed by a professional organization, such as SNA, to develop a training program for school nutrition personnel that focuses on school food service meal preparation and workforce development. The bill also provides $30 million for competitive grants to State agencies for sub grants to local educational agencies and schools to purchase equipment with a value of at least $1,000. The grants may be used to facilitate serving healthier meals, improve food safety, and to help support the establishment, maintenance, or expansion of school breakfast. In addition, the Omnibus bill included $5 million in funding for the USDA Farm to School Grant Program, which doubles current available funding. At a time when funding is hard to come by, the inclusion of our critical school nutrition programs is a recognition by Congress of the important role our programs play in the lives of hungry children. Learn how to combat the growing competition between your school nutrition program and food delivery services. School meal block grants are the biggest threat to school nutrition programs today. Loss of entitlement funding, six cent certification, paid meal reimbursements, and adjustments for inflation would be detrimental to the overall well-being and academic success of students. Under a block grant, schools are forced to let students go hungry or make up the difference at the expense of academics. Program expansion becomes a liability. Natural disasters and economic recessions leave vulnerable populations without. What does this mean for your school and your students? Use SNA's Block Grant Calculator to see an estimate of funding cuts to your school nutrition program. 1. Complete the green fields. 2. Part one shows immediate loss of funds to your program. 3. Part two shows percent decrease in funds over three years. 4. Part three shows the cumulative losses over three years. Your state and federal legislators! Those attending SNA's 2018 Legislative Action Conference should bring their results with them to their appointments on the Hill. Your school board and superintendents who, like you, are invested in the wellbeing and academic achievement of their students. Attach SNA's block grant flyer for those who may need more information. Keep SNA in the loop on your efforts to preserve school meal funding. Contact us at advocacy@schoolnutrition.org if you have any questions. On Friday, January 19, SNA submitted an official comment to U.S. Department of Agriculture (USDA) in response to the interim final rule on "Child Nutrition Programs: Flexibilities for Milk, Whole Grains and Sodium," published in the Federal Register on November 30, 2017. In the comment, SNA expressed appreciation for the Department’s efforts to address the challenges school districts have confronted in transitioning to updated meal pattern requirements. SNA also reminded USDA that school districts are looking forward to a permanent solution eliminating the onerous management of temporary rules and, where allowed, annual waivers. You can read the complete comment here. Label our MdSNA response to Interim Regs. On December 15, 2017, USDA FNS published the SY 2018-19 USDA Foods Available List for Schools and Institutions. USDA works to introduce new products and reformulate items every year based on feedback from states and school districts; this year, they included ten new products for ordering. Those new products include: frozen mixed berry cups; frozen mixed vegetables; chicken drumsticks; grilled chicken breast fillets; pre-sliced turkey ham and smoked turkey; egg patty rounds; and white whole wheat flour. More information about the new offerings can be found in the product preview sheets. New feedback or new product ideas can always be submitted to USDAFoods@fns.usda.gov. New Year's Resolution: Recognize a Colleague! Do you know a stellar kitchen manager, outstanding cook, or inspiring school nutrition director in your school district? Nominate them for a national SNA Member Award and show them how much you appreciate their hard work! Each year the national SNA awards are presented at the Annual National Conference (ANC), where thousands will learn of the achievements of the winners. Employee of the Year—recognizes non-managerial school nutrition employees. Manager of the Year, in honor of Louise Sublette, recognizes a manager, head cook, or assistant manager. Director of the Year—recognizes school nutrition district directors who have served for at least five years. Nominations are due online or to the State President by March 1, 2018. Word documents are available for each award to make it easy for you to gather your thoughts and prepare your nomination in advance. When asked to identify which whole grain food is most troublesome, pasta or noodleswas the top concern, named by nearly half of these districts. The Department of Agriculture on Wednesday released an interim final rule that will cement changes to school meals that Perdue announced in May. The measure, which goes into effect for the 2018-19 school year, will stave off stricter sodium restrictions that were set to kick in last summer and locks in flexibility that Perdue has provided to schools that are having a hard time meeting the whole-grain standards. It also will give schools the option to serve 1-percent flavored milk. Previously, non-fat flavored milk and low-fat milk were permitted as part of the nutrition standards. SNA is pumped: The School Nutrition Association lauded the increased flexibility districts are being given to meet the standards, citing continued challenges at schools across the country. "School nutrition professionals have achieved tremendous progress, modifying recipes, hosting student taste-tests and employing a wide range of other tactics to meet regulations while also encouraging students to enjoy healthier school meals," Lynn Harvey, SNA president, said in a statement. "Despite these efforts, school nutrition professionals continue to report challenges with sodium and whole grain mandates, as well as limited access to whole grain waivers." About those challenges: The group cited recent survey data from its members that found 65 percent of districts still have trouble with the requirement to serve only whole-grain-rich products. The survey also found that 92 percent of responding districts were concerned about the availability of foods that would meet future sodium limits and also be "well accepted by students." Chocolate milk side note: SNA didn't lobby for the changes to the dairy rules, which will make it easier to get chocolate and strawberry low-fat milk onto lunch trays. That was the work of the dairy industry. Health advocates are not pleased: Margo Wootan, director of nutrition policy at the Center for Science in the Public Interest, and many other advocates condemned USDA's move. "The proposal is a hammer in search of a nail," Wootan said in a statement. "Virtually 100 percent of schools are already complying with the final nutrition standards, including the first phase of sodium reduction." Reality check: Despite what headlines have suggested, the changes to the nutrition standards are relatively modest. They leave in place most of the standards championed by former first lady Michelle Obama under the Healthy Hunger-Free Kids Act. Where is USDA's Measure to Change School Lunch Rules? On July 6, USDA sent an interim final rule to the White House that would change some of the school lunch standards championed by former first lady Michelle Obama, including stalling restrictions on salt and locking in flexibility in meeting the mandate to serve only whole-grain-rich foods. The rule is still there, though perhaps not for long. The review being conducted by the White House Office of Information and Regulatory Affairs is supposed to take 90 days, but officials can ask for a three-month extension. The rule has now been under review for 96 days, and the White House has yet to seek more time. Flashback to the lunchroom: Agriculture Secretary Sonny Perdue visited a Leesburg, Va., elementary school a week after taking office to announce he'd give schools more leeway to meet the school nutrition standards beefed up during the Obama administration. While he praised Michelle Obama's efforts on child nutrition, Perdue said schools should be able to serve food that students find palatable and that administrators shouldn't be forced-fed regulations that have increased expenses in some cases. Pros, brush up on that announcement here. A USDA spokesman told MA the rule is still a top priority for Perdue. "The regulatory development process is well underway, and we are working with the Office of Management and Budget to facilitate completion and prompt publication of the rule," the spokesman said. Energize Your Day with School Breakfast is a collection of digital resources available on the USDA’s Food and Nutrition Service (FNS) website. The collection can be used by program operators and other stakeholders to establish or expand the breakfast service within their school. The three modules on the website are: “Getting Started with School Breakfast,” “Implementing Your Program,” and “Marketing Your Program.” The toolkit is intended to help schools determine which type of meal service is best for them, calculate costs of operation in conjunction with helping to develop both menus and a marketing plan to encourage student participation. SNA also provides several School Breakfast Program (SBP) resources, such as the archived Operating a Breakfast in the Classroom Program: Everything You Want to Know About Implementation webinar and this report on school breakfast service times. http://www.usda.gov -This site contains topics handled by USDA including: Food & Nutrition, Food Safety; The Farm Bill and Laws and Regulations. Healthy, Hunger Free Kids Act - This is USDA's site for HHFKA, which includes a link to the Public Law. http://thomas.loc.gov - A source of information to obtain House and Senate activity. You can retrieve information on submitted and passed Bills and Public Laws, check the Congressional Record, and obtain Committee information. This site also has links to state sites and The Library of Congress. http://www.firstgov.gov/Agencies/Federal/Legislative.shtml - The U.S. Government's official web portal for information specifically dealing with the House of Representatives and the Senate. You can also retrieve information on U.S. government agencies. http://www.gpoaccess.gov/legislative.html - This site gives information on Congressional materials and the legislative process.